There hasn't been a post in a long while...I kinda forgot about this blog! 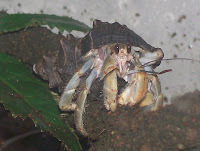 Needless to so say, I decided to get it up and running again with an interesting post on the superfoods that you can feed your crabs to keep them healthy and happy. Superfoods are the best types of foods to feed your crabs and to include in kibbles. Most superfoods have almost every nutrient available inside of them. The superfoods I am going to speak of are all very easy to get online or at your local healthfood store. Bee Pollen: It's true, bee's really make the world go round. Bee pollen is a natural food element that contains almost every nutrient needed for man. It can be easily powedered and the crabs seem to like it. Found naturally, bee pollen is eaten by the bees and they only choose the best nutrients from where to get the pollen. This food has the highest source of protein among all foods, so it is a definate plus. Spirulina: A type of blue-green algae, it should always be a staple in a crabber's natural diet. Found in pill forms, dried forms, or a sheet, spirulina is high in many nutrients. Crabs are known to eat seaweed in the wild, but they don't seem to like it in captivity. Therefore, it is a good idea to hide your spirulina in another food they love, such as honey. This makes a perfect nutritional treat for the crabs. The two superfoods mentioned above are two of the most powerful foods. There are other supplements you can offer such as rooibos tea, honey, propolis, and so on. Have fun offering the foods that give your crabs the energy to go on.